^ Hunt, Kathleen. Horse Evolution. TalkOrigins Archive. 1995-01-04 [2008-10-10]. ^ Prothero D.R, Schoch R. M (2003). Horns, Tusks, and Flippers: The Evolution of Hoofed Mammals. Johns Hopkins University Press. ^ Waage, J. K. (1981). How the zebra got its stripes: biting flies as selective agents in the evolution of zebra colouration. J. Entom. Soc. South Africa. 44: 351 - 358. 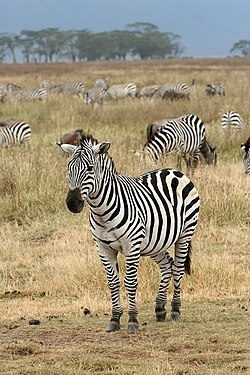 ^ How do a zebra's stripes act as camouflage?. How Stuff Works. [2006-11-13]. ^ How the Zebra Got his Stripes. Gateway Africa. [2008-10-10]. ^ Tim Dirks. 幻想曲 （1940）. Tim Dirks. [2008-10-10]. ^ Zebra Art. 藝術保護. [2008-10-10]. （英文）Churcher, C.S. 1993. Mammalian Species No. 453. American Society of Mammalogists. （英文）Estes, R. (1991). The Behavior Guide to African Mammals, Including Hoofed Mammals, Carnivores, Primates. Los Angeles, The University of California Press.